In the mounded hill of the levee snaking along the Mississippi River, I see a history of man’s negotiation with nature’s might. Along the fertile alluvial plain blanketed by rich sediment, I feel the flood and ebb of the river’s nourishing and destroying waters. As thunder rumbles low through thick air and pregnant clouds release gulley-washing rains, I know the Gulf of Mexico is not far. Where blades of sugar cane brushed gold with the westering sun “reach up to God”1 and lash the wind, I imagine backs broken and fortunes made in its harvest. Finding respite from the rain in a plantation’s breezy gallery, I hear echoes of the West Indies. In this land of river and sun, where its plants and animals and people have shaped it as much as they have been shaped by it, one finds the powerful spirit of place that is the Lower Mississippi Valley. The cultural and physical character we associate with a location creates its unique identity and allows us to form a meaningful connection to it. This feeling of being rooted to a place in turn becomes part of our identity and bonds us together in community with others. By sharing in the repetition and development of traditions we reinforce the identity we hold in common. As our human and natural realms merge and alter each other, a compatibility grows in which a place reflects its distinct identity. As Wendell Berry describes, we cannot know who we are, until we know where we are: the colors of the earth and sounds of the rain, the flora and fauna, the songs and memories, the people and history of a place. Yet today, how do we know where we are, how do we know who we are, when everyplace could be anyplace? Rather than seeing the color of Mississippi’s mud and clay in southern Louisiana’s “Soft Red” and “Hard Tan” bricks, we see buildings made of components mass-produced and mass-transited from anyplace to everyplace. Instead of purposefully adapting a building’s form to a place’s climate, such as was done with New Orleans’ deep-shading eaves, we build the same climate-blind structures in snowy New England as in sunny New Mexico. In the slate-wiped-clean amnesia of our modern world we no longer learn from and transmit the accrued knowledge of how our ancestors built in particular places. Today’s building culture has largely ignored local wisdom regarding materials and climate because it can. Traditional building cultures did not because they could not. In the past, our settlements were tied to and derived meaning from the interplay of culture and place. We formed our cities, towns and villages in defensively strategic positions; along rivers and harbors and railroad lines to support the trade of goods; and on lands that were rich with food or suited to cultivation. Today, when we can work anywhere virtually, what gives our places their reason for being where they are? Until very recently in human history we built the majority of our buildings with locally-sourced materials. Our buildings were imbued with the very color of the earth under our feet, the grain of the trees of our nearby forest. We knew ways to build in response to the climate rather than in spite of it. In this we built our places with mindfulness and meaning. What meaning is there today in how and what we build when we divorce architectural form from the particulars of place? The schism between our built environment and place destroys our identity, ignores traditional wisdom, is environmentally and economically unsound, and leaves us psychologically homeless. We can repair this by renewing a local culture of building. Such a culture is one in which architects design buildings compatible with their cultural and physical place; craftsmen and laborers participate in a dignified community of making; and time-tested construction techniques and local materials are used to build places logically and soundly. In turn when we purchase local materials, employ local labor and capitalize on the unique knowledge of the people of a place, our environment and economy and culture are all strengthened. In reconnecting what we build with where we are and who we are, we form our future such that it answers our physical, social and spiritual needs in the highest and best way. Recently, I had the opportunity to compare two very different visions of how to build today. At the invitation of Ann Daigle, I spent a few days teaching on the Prince’s Foundation’s Culture of Building Skills Summer School in New Orleans. Here, a dozen students, most from New Orleans and Louisiana, began learning about local architectural and building craft traditions so that they may design a new structure at Destrehan Plantation. It seems logical that these students, including a carpenter, mason, developer and architects, would turn to the past traditions of Louisiana to learn how to design something meaningful and durable there today. This logic could not have been more sharply contrasted by the illogical Make it Right project rebuilding houses destroyed by Hurricane Katrina in the Lower Ninth Ward. 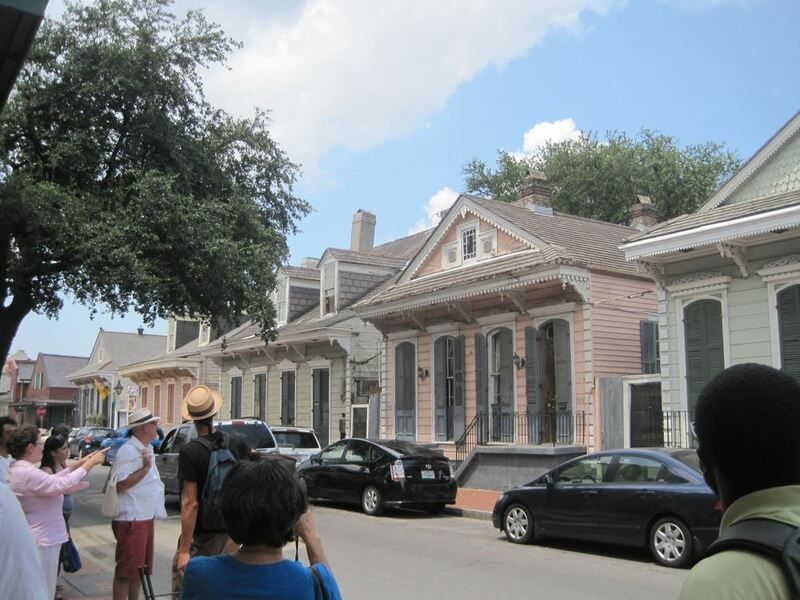 Instead of learning from the highly developed building traditions of New Orleans, Brad Pitt’s all-star cast of architects have designed houses entirely divorced from the massing, language and logic of New Orleans’ architecture. Sticks, wires, panelized walls and stifling enclosed porches are incompatible with the particulars of place that define New Orleans. In a culture that loves its ornament, for example, these architects stripped bare their designs. But, the people shall not be held back. Inhabitants who have moved in have already begun draping their pristine modern boxes with silk flowers, Saints banners, plastic lawn ornaments, wreaths and bows of all sorts. 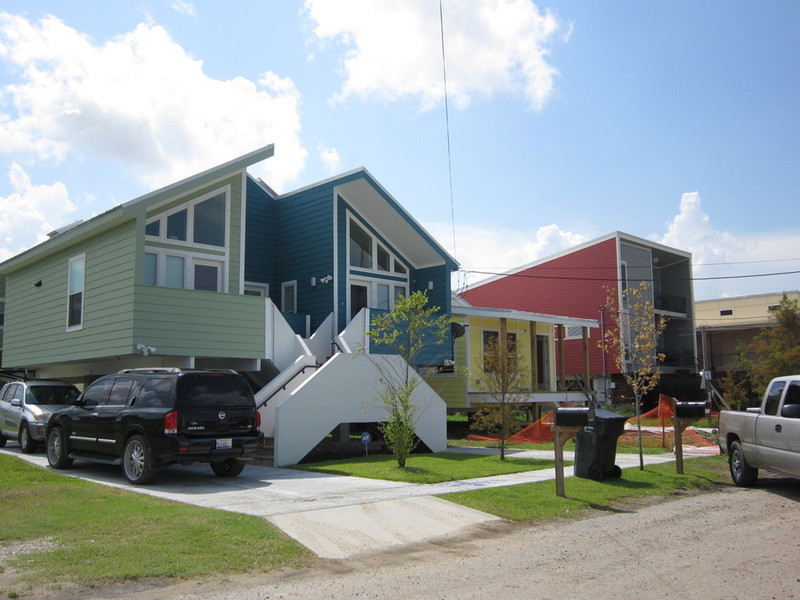 At Make it Right, architectural forms foreign to New Orleans will provide shelter, which is certainly worthy. But they will always be an oddity in a place where architectural form has been carefully worked out over generations to be a language as rich and nuanced and essential as a good roux is to New Orleans’ cuisine. Acting to remedy the loss of wisdom seen in the Make it Right project are diverse organizations operating locally more than ever before. The Prince’s Foundation for Building Community has programs in locations as diverse as England, Louisiana and Haiti. The Institute of Classical Architecture & Art’s national chapters are exploring local architectural wisdom, building networks across multiple disciplines on a local basis. The International Network of Traditional Building, Architecture and Urbanism’s worldwide chapters celebrate and conserve particular traditions of particular places from Canada to Nigeria and Australia, to name but a few. Restore Media’s new local format for its Traditional Building Conference provides an intimate forum for the exchange of location-based knowledge and skill. These organizations, alongside countless craft and preservation groups, are a resource for us when we consider how to build in each new place and time we build. What remains is for us to find our reason and will to build differently than we are. When we build, we build for ourselves. We build with memory of our past and hope for our future. What do you build for yourself? What are your memories of your past? What are your hopes for your future? Standing in the Lower Ninth Ward, flabbergasted that the architects of the Make it Right houses were expending vital resources on the building of houses so incompatible with the people and place of New Orleans, I found my reason. I found my will. Christine G. H. Franck is a designer, author and educator. A recognized leader in education, she was the first executive director of the ICAA, director of its academic programs from 1998 through 2005, and has been a visiting professor at the University of Notre Dame and Georgia Institute of Technology. Currently, Franck serves as trustee of the ICAA, NCAS and member of INTBAU’s College of Chapters. In 2002 she was honored with HRH The Prince of Wales’s Public Service Award for “her outstanding contribution to the study of architecture and design.” Recognition of her design work includes a Palladio Award and John Staub Award. She is co-author of Winterthur Style Sourcebook: Traditional American Rooms. A native of Williamsburg, VA, she holds a Bachelor of Science in Architecture from the University of Virginia and a Master of Architecture from the University of Notre Dame. Thank you so very much, I’m so glad you enjoyed this. Let’s hope we can increase the character of our local places.